It’s High Speed 2 week here in Britain, with the route for the second phase of the London-north of England line announced by the UK government on Monday. It’s a project which has been great news for cartographers (thanks to the endless series of maps which have accompanied various announcements regarding phase 1 and now phase 2) but less good news for civil engineers (not one single clump of earth has been turned for the project) and no news at all for potential train operators: any actual trains seem to be well over a decade away. Far be it from me to suggest that producing maps is an easier way for the government to suggest it’s doing something, rather than actually, erm, doing something. Oh – I just did. As usual, much of the rhetoric around the latest announcements on High Speed 2 has been about how it will be hidden away out of sight. This is an attempt to buy off protestors against the line (“you won’t even know it’s there!”) and is a mindset I’ve questioned before. Don’t forget that Victorian railway engineers were hated for ruining the countryside with the enormous viaducts and bridges needed to carry their lines across valleys and rivers when the British railway network was being built in the first place. Yet those are precisely the structures we now love: from the Forth Railway Bridge to the Ribblehead Viaduct. So why not be brave and accept that High Speed 2 will have a visual impact, and ensure that its impact is positive by commissioning brilliant designs for its infrastructure? Designs that are exciting (or at the very least pleasing) to look at and celebrate what High Speed 2 is setting out to do? Well, rant over, but I thought this week we could turn our attention to a European country that grasped the concept of a high speed rail network many years ago. 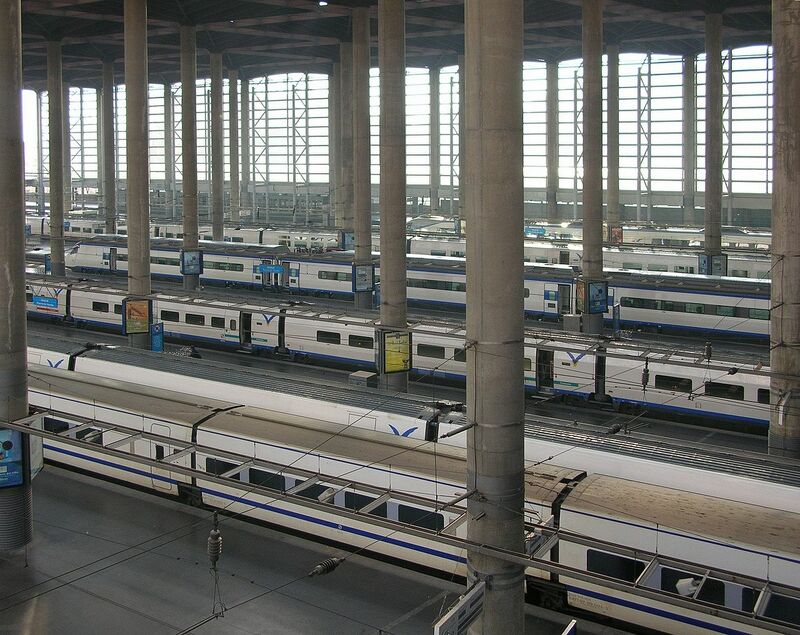 It’s Spain, and this week’s transport beauties are at the two ends of its AVE (Alta Velocidad Española) line between Madrid and Seville, which impressed me when I travelled on it a few years ago (domestic air travel? Pffft!). 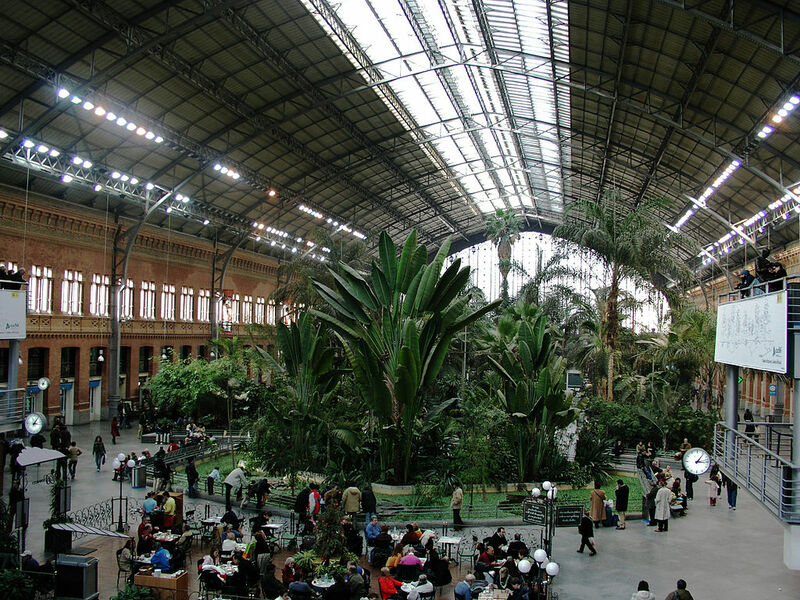 At the AVE line’s northern end, the Victorian railway terminus of Madrid Atocha was transformed, but not in quite the way that the Victorian St Pancras station was at the northern end of Britain’s High Speed 1. St Pancras saw the redesign, reworking and refurbishing of the existing station. 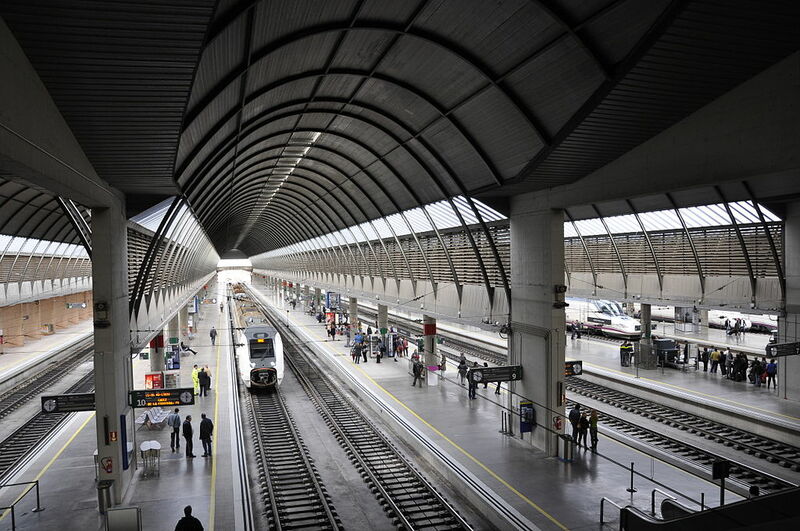 In Madrid, Spanish railway operator RENFE took the alternative approach of building a new high speed train terminal adjacent to the existing station building. But then what to do with the existing building, the most notable feature of which is a high steel and glass roof (in some ways very reminiscent of St Pancras)? You’d never be able to predict it if you didn’t know, so I’ll save on the suspense, and simply tell you that the extraordinary answer to this question was…to turn it into a palm house. It’s an idea so unexpected, so wonderful, and so joyful that it was always going to end up here at some point. The conversion took place in 1992, saving the old terminal (designed by Alberto de Palacio Elissagne and Gustave Eiffel, yes, that Gustave Eiffel) for us all to enjoy and also populating it with shops and cafes. Despite promises of further use, nothing much ever seems to happen with London’s Waterloo International station, closed since the opening of High Speed 1. Taking a cue from Madrid, perhaps Kew Gardens could take it over for use as a new tropical garden under the sinuous glass and steel roof? I fear I’m wandering off topic. So that’s Madrid Atocha. From there, you can catch the AVE train to Seville (Spanish government decision to build a high speed line from Madrid to Seville – 1986, opening of said line – 1992; compare to UK government’s decision to build High Speed 2 – 2010, proposed opening date of phase 1 – 2026, sorry to keep banging on about this but there’s no reason we couldn’t do it as quickly as the Spanish if we really wanted to…) in about two and three-quarter hours. When you arrive in Seville, you do so at Sevilla Santa Justa. An early work by Spanish architecture practice Cruz y Ortiz (also responsible for the dramatic rebuild of Basel station in Switzerland), from the outside Santa Justa’s main building is a little too much like the British Library in London to really inspire affection. 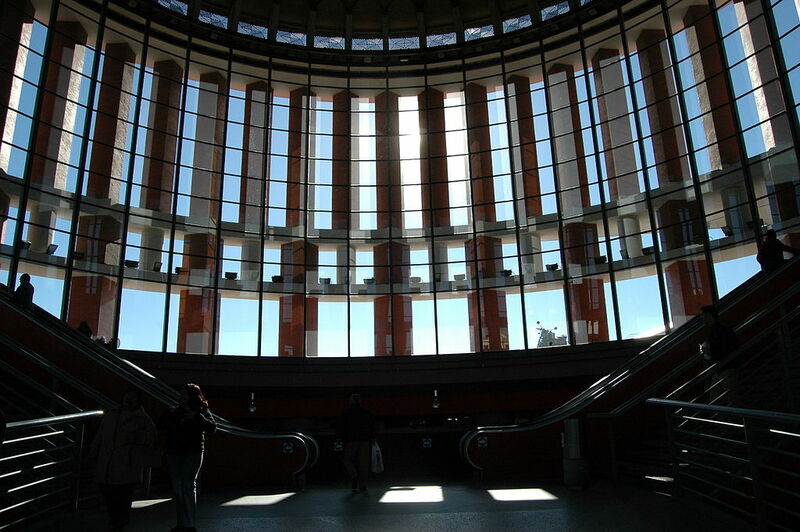 But the inside of the ticket hall is a great piece of modernism. It is, in fact, exactly what the main concourse at London’s Euston station should be like. Have a look at the early black and white publicity photos of Euston, which actually make the place look quite stylish, efficient and modern, and you’ll see what I mean. The good intentions might not make up for the loss of the old Euston (much mourned by those who remember it), but there was an element of sense in the ideas for its replacement. It’s since become dreadfully cluttered up and confused, which is why it’s such a miserable experience these days. 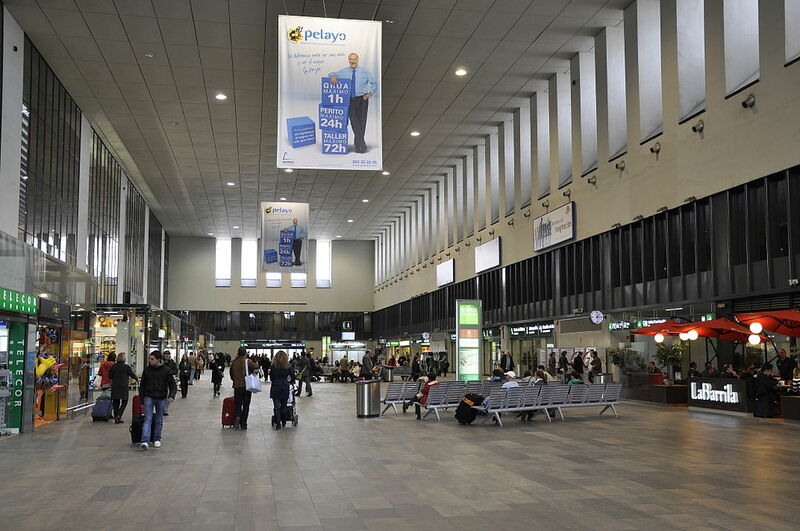 But the absolute best bit of Santa Justa – just like at Madrid Atocha – is the platforms themselves, here covered by a series of six arched roofs in steel and glass, resting on concrete columns. The metal ribbing is simply spectacular. The collection of six is a modern take on the traditional large railway station arched roof, but here each span is taller and slimmer than a Victorian station roof could ever have been, thanks to modern construction techniques and technologies. As Cruz y Ortiz put it, the roofs have, “structural solutions that allow the wide spans to be experienced without actually showing their internal mechanisms”, or as one might paraphrase it, you can’t really work out how they hold themselves up. 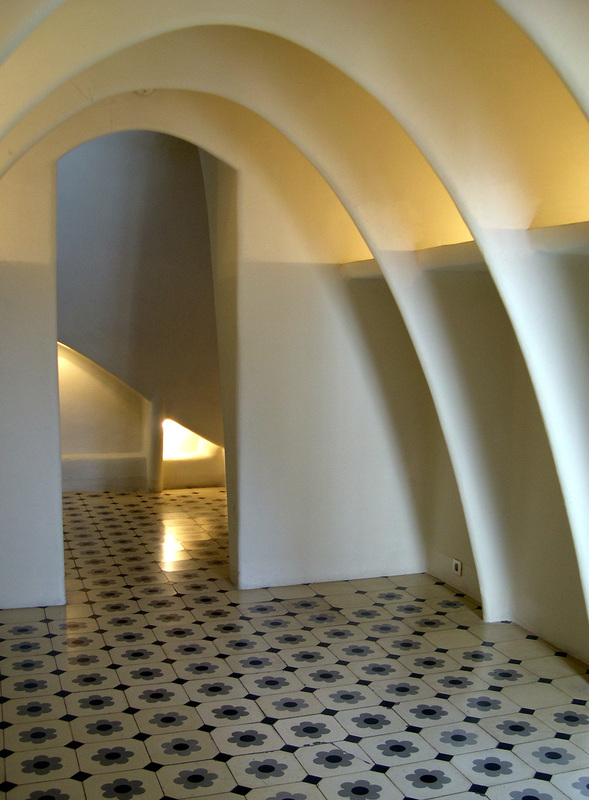 The attic at Casa Batlló, Barcelona. © Daniel Wright, 2007. I wonder if the High Speed 2 stations in Britain will blend ancient and modern so effectively, or provide similar feasts for the eyes? They’re a long time off, assuming they happen at all. In the meantime at least, there are lots of pretty maps to look at. But that’s all.